With an A energy rating, a fantastic layout, and a bold exterior, this house will make everyone's dream home list. It was designed in Spain by NAN architects, who put their focus on making a sleek design that had plenty of flow between the interior and exterior spaces. They wanted the tiny home to have a low profile in the surrounding farm land, and to have as many lovely pastoral views of the green hills as possible. This black and white home is the amazing result. The entrance is tucked back so that that the home feels private-- an important consider for tiny homes whose entrances are often straightforward and too open for privately-minded residents. Also take note of the fantastic stone driveway and smooth white parking space. When you have a tiny home, great finishes like this become a lot more cost-effective. Everything about this little home is smooth and the exterior is no exception. 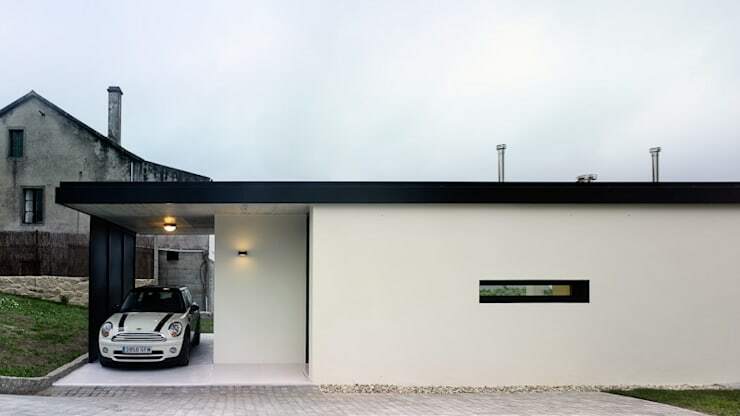 The black frame on the interior if the window, the black line of the roof, and the black panel that protects the car, all make the home look sophisticated and stark. This is the main space of the home, and it includes the living space, the kitchen and the dining space. How do you make such a compressed rooms feel separate? Well, these floor rugs are a good start, their simple texture works with the simple black and white colours of the home, yet they still make each area feel distinct. 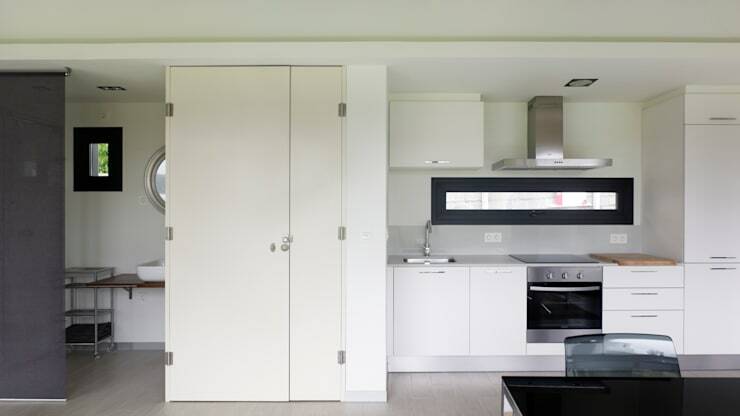 If you love minimalist living spaces, you need to check out our huge gallery of them! It seems odd to have these two spaces so close to one another, but in a tiny home it's really efficient to place all of the utility hook-ups on the side side of the home. So this wall has the kitchen on the right (with the adorable and sleek front window) and the bathroom on the left. The bathroom has a screen for extra privacy next to the sink, and to further separate the bathroom from the rest of the house. The dividing white partial wall here holds a fireplace, which you can see in the background of the third picture if you don't quite see where there's room in the home for this space. From this side we can see that the back of the home is all window, resulting in some amazing views. The designers have cleverly included some sheer curtains for a touch of privacy at night. You wouldn't think this tiny house could fit a walk-in closet, but there it is! Now we see why the bathroom's black rolling privacy screen is so important, there likely isn't enough room to fit a swinging door. 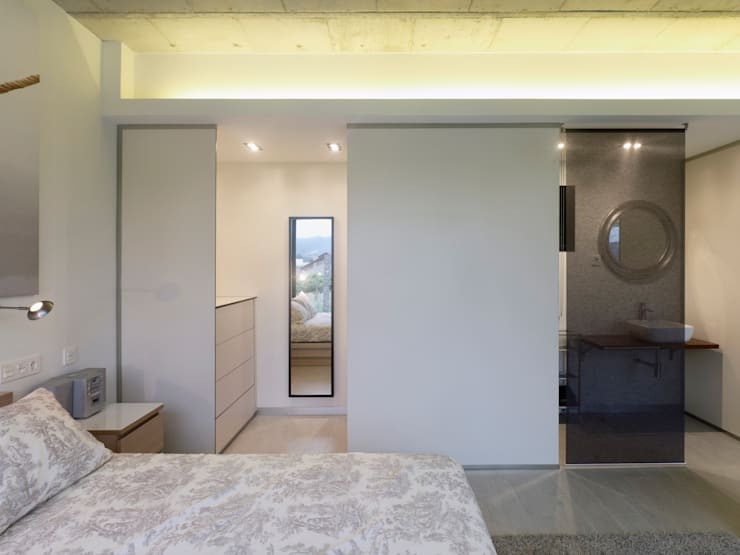 You might think that's a poor design choice, but by squeezing the bathroom over the architects have managed to fit in a decent sized walk in closet, with mirror! For some, this is a really functional trade off. When we take a few steps back we see that the architects have included a stark porch space that acts as a connection between the interior and the exterior of the home. It has enough room for a simple woven chair that matches the mats in the home, making this home perfect for the practical single person. Small homes like these give birth to all kinds of practical designs. 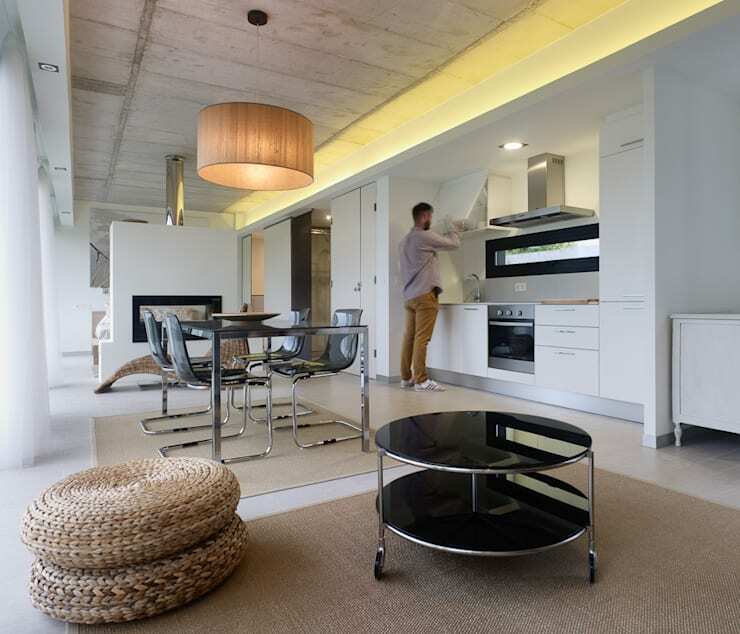 For more, take a look at ten of the best one-room apartments. Do you feel like the bathroom in this home works? Let us know in the comments.